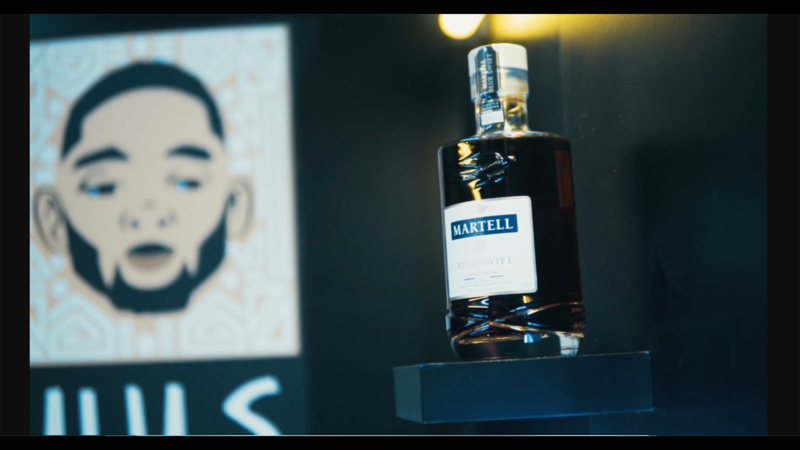 Afro Swift, brought to you by Martell Blue Swift, is the brainchild of Afrobeats star DJ Juls. PR agency John Doe came to Marble with a clear vision of how they foresaw the event transforming the renowned Hospital Club, for a celebration of the sophisticated and vibrant panafrican scene. The venue was truly transformed, brining colour and light into the space. Upon entry, our stand-out, bespoke made Martell photobooth was positioned outside the front doors, where the guests would line up to get that money shot. They were then handed a speciality Martell cocktail and lead to the bar, which was decorated with tropical palms, hanging ferns and low lit candles. We provided huge wall backdrops to protect and cover up the venue’s recently refurbished walls, which allowed the brand to shine through. The back seating areas were transformed into VIP seating, with authentic African props, masks, candles, lanterns and drums were used to create a shrine feel. The other side of the room told a very different story. Here the client wanted to bring out UV colours, african prints and dancers, again with the tropical vibe to really get the party going. The DJ booth was carefully curated and made by Marble to look like it was growing out of the jungle – with hanging plants and moss as well as larger palm trees, with some added branding for the full effect. The party was kick-started with some UV painted dancers, which successfully brought up the vibe right up until the doors were closing! It was a great night with some very talented people, and we look forward to the next one very soon!